Americas favorite frog, Kermit rejoins the Parade after a 12-year hiatus. Sponsored by The Jim Henson Company, this brand new Kermit balloon will debut on Thanksgiving Day to cap off the yearlong celebration of the 25th anniversary of The Muppet Show. The first Kermit balloon premiered in 1977 and flew for 13 years. Larger than life at 78 ft. long, 36 ft. wide, and 61 ft. tall, the new Kermit will turn blue skies green as he is filled with over 11,000 cubic ft. of helium. Already receiving his own Star on the Hollywood Walk of Fame on November 14, Kermit will take time out of his hectic schedule to fly down the Great White Way in Macys Thanksgiving Day Parade. In addition, Kermit along with Miss Piggy and the rest of the Muppet gang, will be starring in A Very Merry Muppet Christmas Movie to air this December on NBC. Other new balloons debuting this year include: Charlie Brown & The Elusive Football, Little Bill, Mr. Monopoly, Uncle Sam, and the Centennial Balloon. A new Kermit doll is going to be made available at Macy's stores this November. Kermit comes with a camera and a roll of film. He's a "Frogtographer" wearing a hat with ear flaps that hang down. He will be $16 with a $35 purchase. 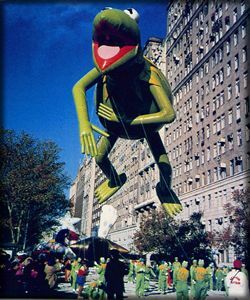 Macy's has also released a beautiful Thanksgiving Day Parade 2002 Snowglobe featuring Kermit leading the other balloons across the New York skyline. A commemorative 2002 Kermit Christmas Ornament will be released by Lenox and available at select Macy's stores. The Macy's Parade will air on November 28th, Thanksgiving Thursday, at 9 am eastern, 8 am central on NBC.